The Tennessee Solar Institute (TSI) was selected as one of 22 regional teams to receive funds from the Department of Energy to improve the efficiency and reduce costs to the process of installing solar on homes and businesses. TSIwill receive $622,960 and will partner with local building officials to implement model permitting, interconnection, and net metering standards. The team will also develop an integrated smartphone/tablet app to guide individuals through the application process. The University of Tennessee is partnering with the Tennessee Valley Authority; The City of Knoxville, the City of Franklin, Metro Nashville, Memphis/Shelby County; Knoxville Utilities Board; Nashville Electric Service; Memphis Light Gas & Water; and Middle Tennessee Electric Membership Co-op. More details and the full list of awardees can be found at http://energy.gov/articles/sunshot-rooftop-challenge-awardees. 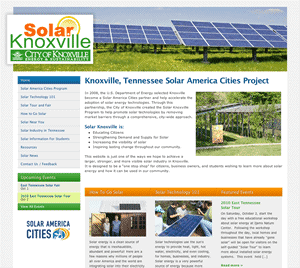 Knoxville, Tenn. (August 11th, 2010) – Knoxville Solar America City program is excited about upcoming solar energy events in the Knoxville area; two notable solar projects are having their ribbon cutting ceremonies this Thursday and Friday. The first ribbon cutting takes place on Thursday, 8/12, at Efficient Energy of Tennessee’s 1-megawatt (1,000 kilowatt) solar farm located off of Andrew Johnson Highway. Currently, this system is the largest in the Tennessee Valley area and serves as a solar energy milestone for Knoxville. 4,600 SHARP solar panels manufactured in Memphis, Tennessee make up this solar farm and it will be home to SHARP’s two millionth, gold-plated panel. SACE is honored to have played a role in the development of this solar energy landmark. This Friday, 8/13, the City of Knoxville is having a ribbon-cutting event at 11:00 am for the brand new Knoxville Station Transit Center, which will be the first municipally owned, LEED certified building. It will incorporate solar energy through a 4-kilowatt solar array installed bySustainable Future and funded by the Knoxville Solar America City program. SACE coordinates this program in collaboration with the City of Knoxville. Other significant “green” aspects of this Transit Center are its geothermal system, green roof, shaded facades, bike storage, efficient lighting, and recycling bins. Another recent event worth mentioning in the Tennessee area is the commissioning of Outpost Solar’s Parking Area Solar Array (PASA) on August 4th in Pulaski, TN. This 20-kilowatt array was installed in the parking lot of Richland LLC, a metal fabrication facility and a licensed industrial contractor. The PASA is used for charging electric vehicles and it is the first one of its kind in the Southeast. You are currently browsing the archives for the Policy category.